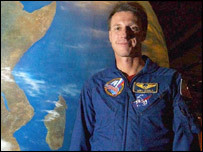 Astronaut Dr Michael Foale has been made a CBE. Dr Foale, 47, now a US citizen but who still regards Cambridge as his home town, was honoured by the Queen for his services to space exploration. Dr John Dudeney, of Wilburton, who works for the British Antarctic Survey, is made an OBE for services to science. Crossword compiler the Rev John Galbraith Graham, of Huntingdon, is made an MBE for services to the newspaper industry. Professor Jean Thomas, CBE, FRS, of Cambridge, Professor of Macromolecular Biochemistry, University of Cambridge, for services to biochemistry. Jonathan Hoyle, senior civil servant, Ministry of Defence. Celia Bennett, of Leighton Bromswold, for services to the meat and livestock industry. Dr Colin Lattimore, JP, of Cambridge, for services to English decorative and applied fine arts and to the community in Cambridge. Keith Day, of Cambridge, for services to the NHS. Nazim Khan, of Peterborough, for services to the community. Ruth Lingard, of Ickleton, for services to disabled young people. Maria Mendonca, of Peterborough, for services to education. Thakorbhai Mistry, of Huntingdon, for services to the community in Alconbury. Stephen Silk, of Cambridge, for services to the aerospace industry. Angeline Walters, of Huntingdon, for services to the police. Christopher Stevenson. Detective Chief Superintendent, Cambridgeshire Constabulary. If the PDF document does not open automatically, you may need to download Adobe Acrobat Reader. New Year Honours: What do you think?